Tranquil turquoise water, over 200 feet of white sandy beach and comfortable accommodations create the perfect vacation atmosphere at Veranda Beach Club. Located on the Gulf of Mexico on Longboat Key near Sarasota, these timeshare condos are situated close to shopping and a variety of outdoor activities. Tranquil turquoise water, over 200 feet of white sandy beach and comfortable accommodations create the perfect vacation atmosphere at Veranda Beach Club. Located on the Gulf of Mexico on Longboat Key near Sarasota, these timeshare condos are situated close to shopping and a variety of outdoor activities. For vacationers looking for a leisure getaway with entertainment for the entire family, Veranda Beach is the ideal location. 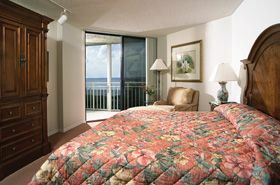 Longboat Key timeshares for sale in the Veranda Beach Club offer either two bedroom or four bedroom units with two or four bathrooms and the ability to sleep six to ten people. Two bedroom units either have a full view of the beach or a partial view and feature a king size bed in the master bedroom and twin beds in the second room. Kitchens are fully equipped with dishwasher, laundry facilities, and tile floors providing beauty and convenience. Televisions, linens including beach towels, and comfortable lounge chairs on the veranda outside the units give families all the comforts of a vacation home. Swimming in the 72-foot heated - fresh-water swimming pool, relaxing in the whirlpool spa, or sunbathing on the beach will provide hours of fun for everyone in the family. Outdoor activities include bicycle trails with bicycle rentals offered free of charge, racquetball, tennis, beach volleyball, and fishing equipment. Feeding the seagulls, finding shells and hermit crabs, and building sandcastles on the beach offer hours of entertainment. Kids and adults will always find something to do at Veranda Beach Club. Tropical landscaping and beach walks make these Longboat Key timeshares for sale an excellent vacation choice. A CVS and Publix grocery store are across the street, while the Ringling Museum and a variety of cultural activities nearby create an opportunity to either relax and hang out at the resort or explore other areas of the island. Families looking for a quiet and peaceful location to enjoy time together and savor the beauty of the water and beach will find Longboat Key exceptional. Contact Veranda Beach Club Specialist Today!